A case report of first-trimester Cesarean scar pregnancy treated with systemic Methotrexate (MTX) followed by oral Mifepristone therapy is presented. It is the rarest kind of ectopic pregnancy and may lead to severe life threatening complications such as uterine rupture and severe hemorrhage or may have adverse effect on future fertility. Hence it is important to have early and accurate diagnosis to avoid complications and preserve fertility. Ectopic pregnancy is an important cause of maternal morbidity and mortality. Of all reported pregnancies 1 to 2% are ectopic, which include the cesarean / hysterotomy scar ectopic pregnancy whose incidence is about 6.1% of all ectopic pregnancies. Cesarean scar pregnancy is a rare type of ectopic pregnancy defined as a gestation completely surrounded by myometrium and fibrous tissue of previous scar, separate from endometrial and endocervical cavities. It occurs when pregnancy implants in the area of the previous cesarean scar. Presence of microscopic tracts from the scar site in the cavity into the myometrium allows the blastocyst to implant wholly within the myometrium. Treatment includes surgical and medical therapy with Methotrexate, or Mifepristone. A 35 year old G3P1L1A1 at 5.3 weeks of gestation was referred from a private hospital with the diagnosis of cesarean scar pregnancy. At presentation the patient had no complaints of abdominal pain, vaginal bleeding, or syncopal attack. Her past obstetric history included preterm lower segment cesarean sections done 13 years back and a spontaneously abortion at 2 months of gestation 4 years back. Check curettage was not done. On examination vital parameters were stable. Abdomen was soft; there was no guarding, rigidity or tenderness on palpation. There was a Pfannenstiel scar. On speculum examination no bleeding was seen. Her serological and biochemical preoperative investigations were done. Hemoglobin was 13.1 g/dL. All other investigations were in their normal range. 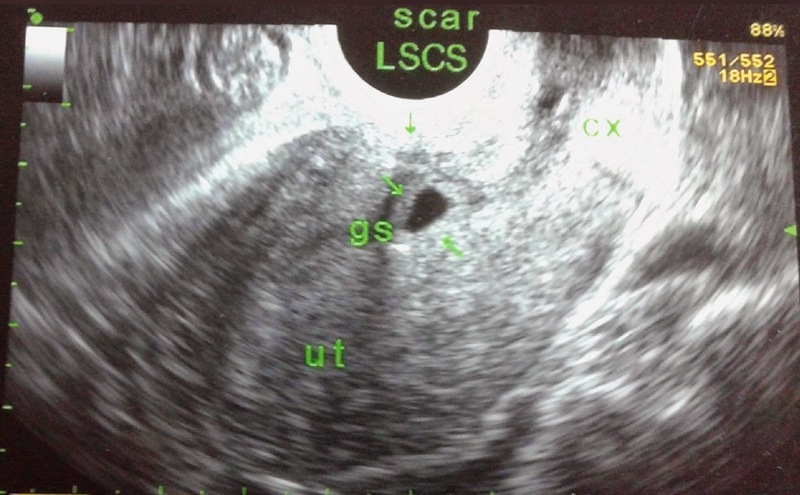 Ultrasonography (USG) revealed a gestational sac with yolk sac and peripheral ring vascularity at the previous scar site. Mean sac diameter was 9 mm corresponding to 5.5 weeks of gestation. No fetal pole was seen. Endometrial and endocervical cavities were empty and both ovaries were normal. Endometrial thickness was 7 mm. Figure 1. 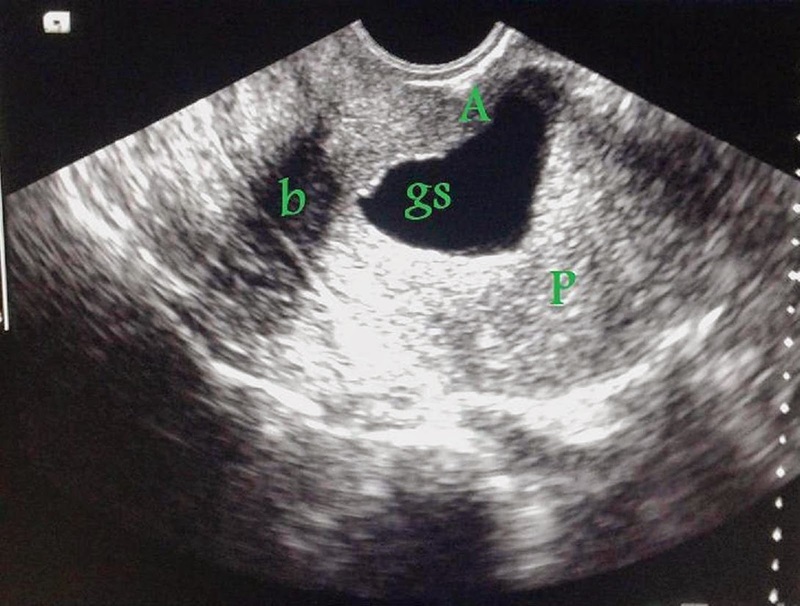 Transabdominal USG image of scar ectopic pregnancy; gs and thick arrow: gestational sac, ut: uterus. Thin arrow the scar of LSCS (anterior myometrium); green line posterior part of the anterior wall myometrium. Figure 2. 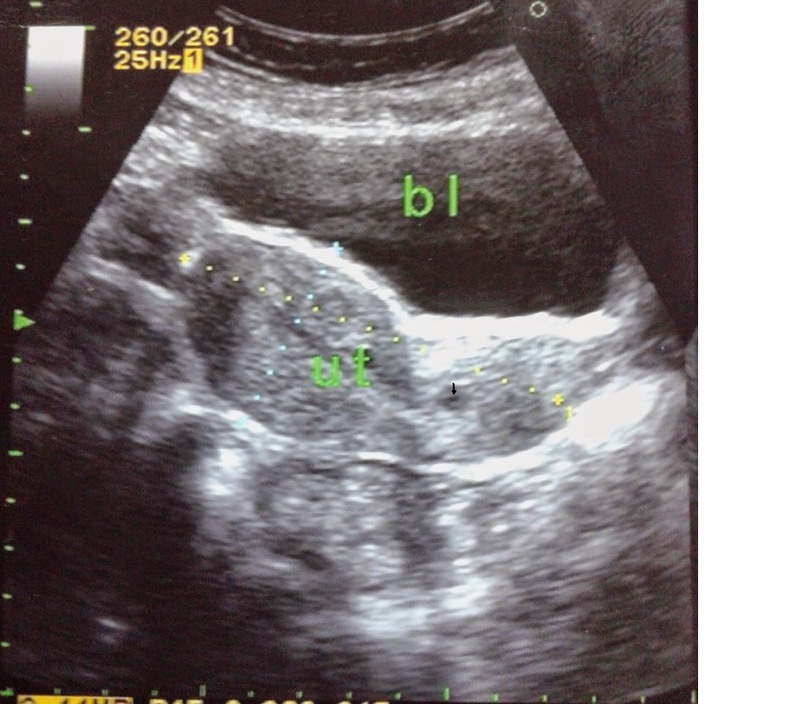 Transabdominal USG image of scar ectopic pregnancy; arrow mark: gestational sac. 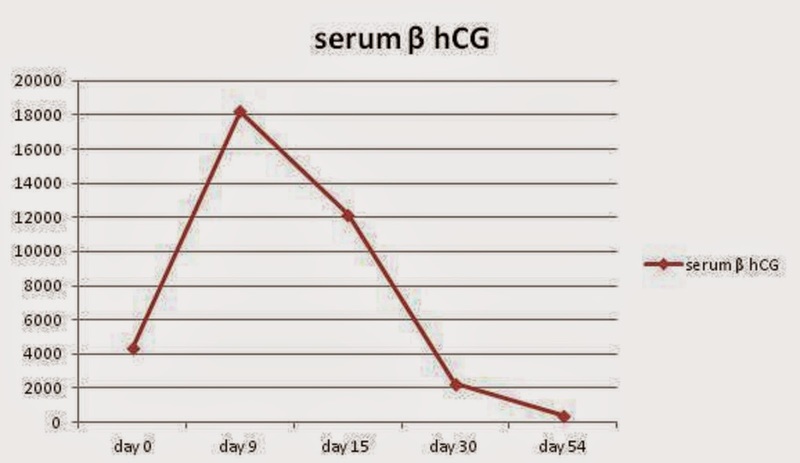 The serum level of ß-HCG on day 0 was 4309 mIU/mL. Since the patient was stable option for medical treatment was taken. Injection Methotrexate 0.5mg/m2 , total dose of 80 mg was given intramuscularly. The patient was followed up on day 9 with serum β HCG. The serum β HCG increased to 18,223 mIU/mL. USG on day 11 showed gestational sac diameter had increased to 1 cm corresponding to 6.2 weeks and yolk sac was present. In view of increase in serum βhCG level and USG finding, tablet Mifepristone 200 mg was given orally. The patient further followed up on day 15 with serum βhCG which was 12,168 mIU/mL and on day 30 was 2264 mIU/mL. She had her normal menstrual cycle on day 34. On day 54 serum βhCG was 387 mIU/mL. USG reported increase in gestational sac diameter to 31 mm , irregular and without any yolk sac or fetal pole in anterior myometrium as seen in Figure 3. The patient remained hemodynamically stable throughout follow up. Figure 4. The decreasing trend of serum β HCG after Methotrexate followed by Mifepristone treatment. Cesarean scar ectopic pregnancy is very rare condition with increasing trend of incidence. This is because of increasing rate of cesarean section and newer advances of diagnostic technology. As the cesarean scar ectopic pregnancy is very rare, there are no ideal management options available. The treatment options depend on the patient’s hemodynamic condition, severity of vaginal bleeding, gestational age, βhCG levels, demonstration of fetal cardiac activity, need for future childbearing, and the available infrastructure and expertise. A patient with uncontrolled bleeding and/or uterine rupture usually requires surgical management. Surgical management includes conservative and radical procedures. The conservative procedures include evacuation of the pregnancy or trophoblastic tissue, wedge resection and repair of the scar either by laparotomy or laparoscopy; bilateral ligation of anterior division of iliac artery and dilatation and curettage. A radical procedure like hysterectomy is done in patients with uterine rupture not willing for conservation of uterus or having uncontrolled bleeding. Medical management is done in patients with stable vital parameters and minimal or no bleeding. Medical management includes local or systemic injection of Methotrexate. The medical management requires long duration follow up. Complications in medical management like bleeding, failure of resorption or persistence of ectopic pregnancy, morbid adherence of placenta in future pregnancy may later require surgical management. Also there is a possibility of long term complications like scar dehiscence, scar rupture, and repeat cesarean scar ectopic pregnancy. The surgical repair of the scar is recommended before the next conception following Methotrexate treatment. The success of Methotrexate depends on serum βhCG level, size of ectopic pregnancy and cardiac activity. High success rate is found if serum βhCG level is less than 3000 IU/L. Patient’s with serum βhCG levels more than 3000 IU/L can have good outcome, but require long follow up, repeat doses of Methotrexate and higher medical cost. [1,5] The presence of fetal cardiac activity on USG has poor success with medical management. The local injection of Methotrexate into the gestational sac is a satisfactory form of treatment of cesarean scar pregnancy. The follow up of medical management is done by serum βhCG which is marker of trophoblastic viability. Other parameters used for monitoring are gestational sac volume and degree of vascularity. In our case, as the patient was having stable vital parameters with minimal bleeding, medical treatment with Methotrexate was given. The 15% drop between two βhCG levels at an interval of a week is expected with Methotrexate treatment. In our case the serum βhCG rose by 425%. As our patient did not develop any bleeding, 200 mg of Mifepristone was given for further treatment. Mifepristone is an antiprogesterone drug used in medical termination of pregnancy in the first trimester. The anti-progesterone activity of Mifepristone helps to destroy and detach the chorionic villi, thus making Methotrexate more effective. With use of Mifepristone there was a 33% fall seen in serum βhCG level within one week. The fall continued on further follow up. USG showed an increase in the size of the gestation sac when quantitative βhCG level was 387 mIU/mL probably due to bleeding that occurred due to detachment of the chorionic villi. A meta-analysis has reported the more effective use of combination therapy of Methotrexate and Mifipristone over Methotrexate alone . Combination therapy of Methotrexate and Mifepristone is found to be effective with less requirement of repeated dose of Methotrexate avoiding its side effects. Further studies are required for evaluation of combination therapy of Methotrexate and Mifepristone or Mifepristone alone in management of cesarean scar ectopic pregnancy. 1. Seow K.M, Huang L.W, Lin Y.H, Lin. M. Y., Tsai Y.L and Hwang J.L, Cesarean scar pregnancy: issues in management. Ultrasound Obstet Gynecol 2004; 23: 247–253. 2. Godin P. A, Bassil S, and Donnez J, “An ectopic pregnancy developing in a previous caesarian section scar,” Fertility and Sterility, 1997; 67(2):398–400. 3. Rotas MA, Haberman S, Levgur M: Cesarean scar ectopic pregnancies: etiology, diagnosis, and management. Obstet Gynecol 2006, 107:1373-1381. 4. Hasegawa J, Ichizuka K, Matsuoka R, Otsuki K, Sekizawa A, and Okai T, “Limitations of conservative treatment for repeat Cesarean scar pregnancy,” Ultrasound in Obstetrics and Gynecology, 2005; 25(3): 310–311. 5. RCOG, The Management Of Tubal Pregnancy. Green top Guideline No. 21, May 2004, Reviewed 2010; 3-4. 6. Timor-Tritsch IE, Monteagudo A, Santos R, Tsymbal T, Pineda G, Arslan A A. The diagnosis, treatment, and follow-up of cesarean scar pregnancy. Am J Obstet Gynecol 2012; 207:44.1-13. 7. Gazvani M.R, Baruah D.N, Alfirevic Z and Emery S.J. Mifepristone in combination with Methotrexate for the medical treatment of tubal pregnancy: a randomized, controlled trial Human Reproduction1998 ;13(7) 1987–1990.